Hey everyone! Hope you are all well. Today I thought that I would do another Christmas themed post (don't worry I have a couple of non-Christmas themed posts coming your way too ha-ha) showing you all my favourite places to do Christmas shopping. This year because I have been ill for the past couple of weeks most of my Christmas shopping has been done online so therefore I will include a lot of websites. I'm finally on the road to recovery so from tomorrow I'll be hitting the busy town centres. Hopefully this will give you a good idea of where you can do your Christmas shopping. I absolutely love these stores at Christmas. I just think that they are such amazing shops and even though they are not cheap at all they still are the best places to browse and do a bit of window shopping. I do think Christmas is the time of year when you can splash out a little bit on your loves ones as well and these are definitely the places to do this. With each of these stores containing popular brands such as Michael Kors, Ted Baker, Charlotte Tilbury etc. you can't go wrong. As I live in London I have the pleasure of seeing the beautiful Christmas displays that they all put up in their Central London (Oxford/Regent Street) stores and they never disappoint. Obviously if you don't have a regular income like me then you will stay clear of these stores or if you go near them buy the cheapest products haha! If you are looking to give affordable yet good quality clothing, bags and purses as Christmas presents then I think this is the store to go to. I have bought a few purses for presents there throughout the course of this year. It's definitely one of my favourite stores and they are always changing their stock too so if you like something I would wait long, especially this time of the year! I'm probably the only blogger to have never bought a single item of clothing of asos. I'm always interested in their other quirky little products and if you saw my male gift guide then you will know I have been picking their brains for gift ideas this year. I've ordered a few items from their gift section which consists of well known brand names such as Benefit and Cath Kidston. Definitely one site to consider if you are looking for Christmas gifts. I kept seeing this name pop up over all social websites and I was really intrigued so last year I headed over to their website and it has literally been one of my favourite places to buy gifts. What you'll find on the website is exactly what is stated in the name of the brand - quirky gifts that you won't find anywhere else on the high street. I have ordered a few Christmas presents off them already this year and I am super super excited for my family and friends to get them as they wouldn't have seen anything like it before. The products on this website range from being super cheap to crazily expensive so no matter your budget you are certain to find something. Good Old Argos! You pop in store, browse the catalogue for a product, fill in a form, pay and wait to collect your product at your pick up point! Quick and simple! I absolutely love this store. I've been using argos so much this year already as I just hate it when you are in a shop, you pick up a product and someone beside you is literally eyeing you up to see if you'd buy it or put it down so they can jump on it! So annoying. You get none of that with argos and I absolutely love it. You can also order on their website and pick up the product in your nearest argos the very same or next year! What more can you ask for? When I get all panicky and just can't think of any Christmas presents for the ladies in my life the body shop always pulls through with their huge variety of products and very inexpensive gift sets. This year one of my favourites is the Glazed Apple gift set which literally comes packaged in a silver apple. It's beautiful and perfect for reusing after as well. Check out their website for their full collection of products and gift sets. Trust me, you'll find something! Covent Garden is my absolute favorite place in London. I go there every single time I pop into the centre of it and I just absolutely love it. It's such a quirky little place and has so much going on from street performers to people preparing your food right in front of you! They also have loads of different stores from Apple to Michael Kors to the newly added Urban Decay store and of course L'Occitane. As a beauty blogger what more can you ask for? Only open from November through to the beginning of January in London's Hyde Park Winter Wonderland is another place that is truly extraordinary when it comes to Christmas presents as they have a huge variety of stalls with very unusual presents. It's not the cheapest place to buy from when it comes to Christmas gifts but I'd highly recommend it. It's definitely a place that will truly get you into the Christmas spirit. So there we have it some of my favorite places to browse and head to this time of the year! I hope this cold/flu/virus I'm suffering with at the moment disappears purely because I do want to do Christmas shopping properly. I went to Winter Wonderland today and as much as I enjoyed it I'm still ill so I was cold and grumpy. Go away Flu! Let me enjoy Christmas! 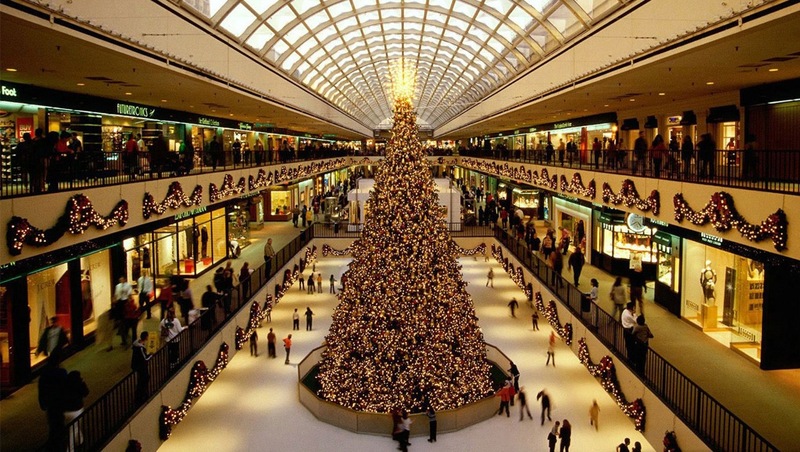 What are your favorite places to do Christmas shopping?